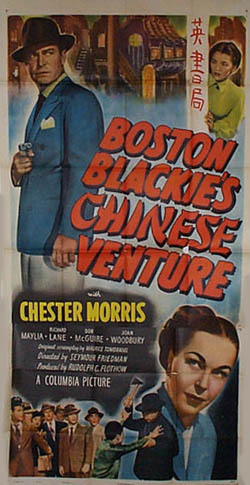 This is the fourteenth movie in the Boston Blackie series. and must track down the real killer in Chinatown. 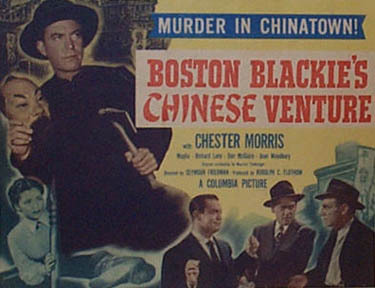 After Mei Ling discovers the body of her uncle, Charley Wu, in the Chinese laundry he owned, the police question reformed safe cracker Boston Blackie and his sidekick The Runt. Blackie admits that he was at the laundry and, because Charley was not there, wrote his name on a piece of paper and attached it to his laundry. Then Mei Ling informs the police that Charley had telephoned Bill Craddock, the owner of the Club Cathay where she works, after he discovered a strange package in the club's laundry delivery. Craddock tells the police that he did not know what the package contained and adds that Charley objected to Mei Ling working at the club. Later, Mei Ling asks Blackie to watch Craddock, because she suspects that he knows more than he will admit. At the club, Blackie sits in the bar, pretending to be drunk, while Runt watches outside. 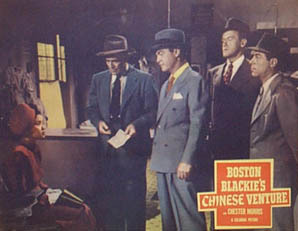 Blackie overhears a conversation between Craddock and his girl friend Red, and when she leaves the club, Blackie follows her to a movie theater in Chinatown, which is owned by Pop Gerard. From there, Runt follows her to her job working as a shill for a Chinatown tour. While the guide takes the tourists along some corridors, where they witness staged "scenes" with fantan players, Chinese slave girls and an attack by a hatchet man, Red slips away for a few minutes to speak with Reiber, a Dutch jewel cutter, who has been forced to work with her. The tour ends at Wong's Curio Shop, where the guide is given a package of tea by the clerk. After observing the exchange, Blackie also buys some tea and switches packages with the guide. Later, Blackie and Runt examine the tea and discover cut diamonds among the leaves. The next morning Blackie and Runt ask Craddock to cut them in on his jewel racket, but at first he professes not to know what they are talking about. When he is about to give Blackie some information, someone throws a knife in his back. 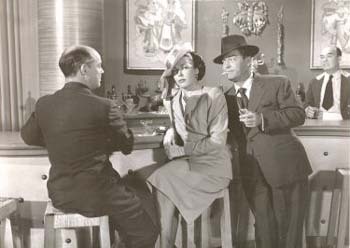 During the next Chinatown tour, Blackie and Runt then kidnap the guide, with Mei Ling's help, and question him. The guide reveals nothing, and Blackie and Runt are forced to run from the police, who want to question them about Craddock's murder. While hiding at the movies, Blackie and Runt see Red enter a closet and follow her through a secret door into Reiber's laboratory. There, after Reiber reveals that Gerard committed the murders, Gerard tries to kill Blackie and Runt. His shots attract the attention of the police. 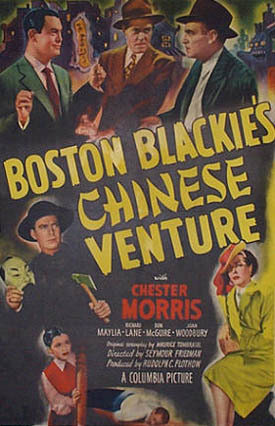 Following Red, Blackie then leads them all to Wong's Curio Shop. In order to prove that Red and Gerard are recutting stolen jewels, Blackie proceeds to examine all the packages of tea. The jewels are found in the very last package, and Runt suggests that they use the opened tea for the Boston Blackie Tea Party.